The US Central team celebrates its 7-2 victory against Asia-Pacific of Melbourne, Australia, in the Senior League World Series championship game at Mansfield Stadium in Bangor on Saturday. 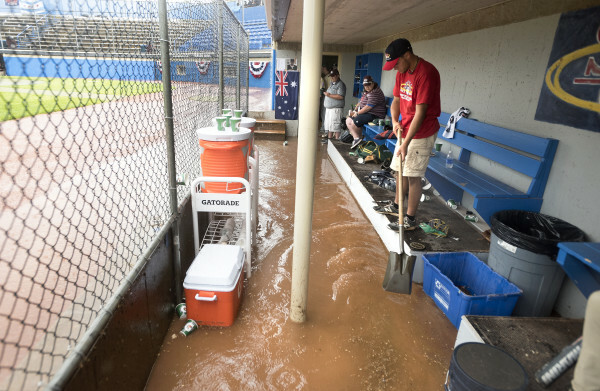 Senior League World Series volunteer Ben Pushard uses a shovel to keep a drain clear in the Asia-Pacific of Melbourne, Australia, dugout at Mansfield Stadium in Bangor on Saturday. The championship game was interrupted by a thunderstorm that dumped about a half inch of rain in 30 minutes on the Bangor area flooding the dugouts. Asia-Pacific of Melbourne, Australia's Jai Littleton (right) slides to third base beating the throw to US Central of Chicago's Dave Navarro (left) during the Senior League World Series championship game at Mansfield Stadium in Bangor on Saturday. US Central won the game 7-2. 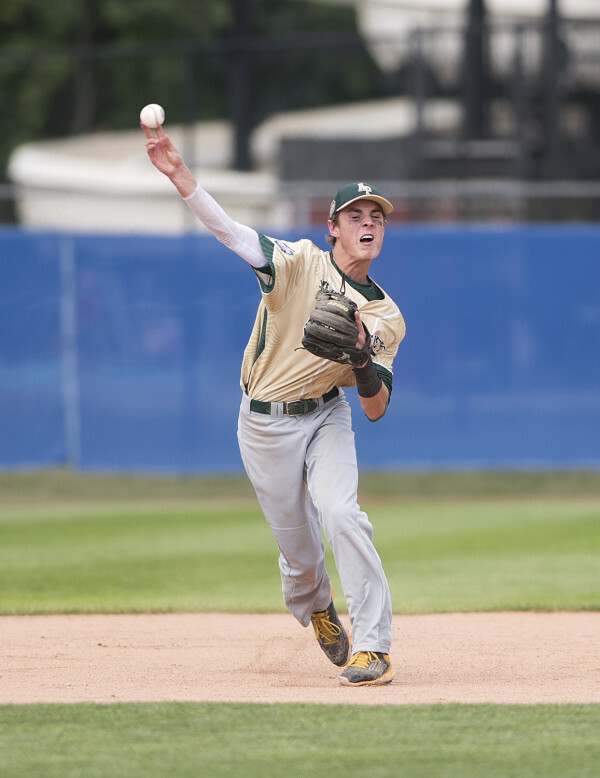 Asia-Pacific of Melbourne, Australia's Jordan Barnett throws the ball to first base during the Senior League World Series championship game against US Central of Chicago at Mansfield Stadium in Bangor on Saturday. US Central won the game 7-2. US Central of Chicago's Zack Verta pitches against Asia-Pacific of Melbourne, Australia, in the Senior League World Series championship game at Mansfield Stadium in Bangor on Saturday. US Central won the game 7-2. 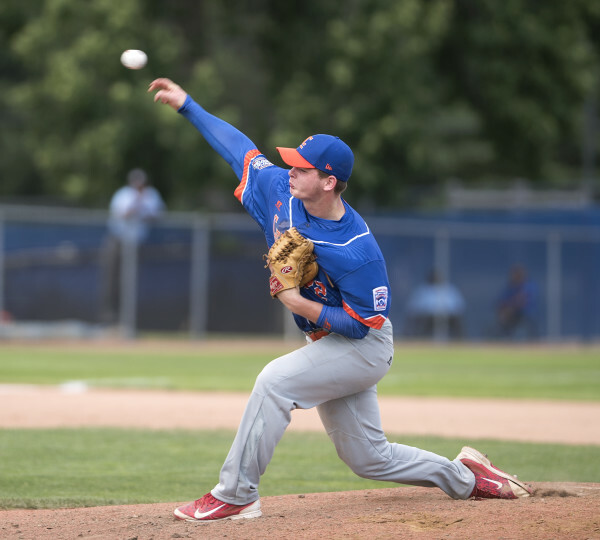 Asia-Pacific of Melbourne, Australia's Jackson Boyd pitches against US Central of Chicago in the Senior League World Series championship game at Mansfield Stadium in Bangor on Saturday. US Central won the game 7-2. US Central of Chicago's Zack Verta slides to third base beating the tag by Asia-Pacific of Melbourne, Australia's Josh Meyer in the Senior League World Series championship game at Mansfield Stadium in Bangor on Saturday. US Central won the game 7-2. 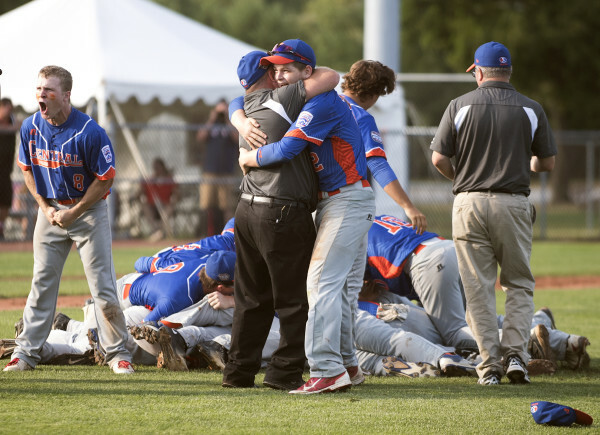 BANGOR, Maine — The celebration by the Clear Ridge Little League All-Stars was sheer Americana — a pig pile in front of the mound — after their 7-2 win over Australia in Saturday’s Senior League World Series championship game at Mansfield Stadium. Clear Ridge, comprised of players from the Garfield Ridge and Clearing communities on the southwest side of Chicago, became the first champion from Illinois in the SLWS’ 55-year history and the first winner from the U.S. Central region since Urbandale, Iowa, in 2005. 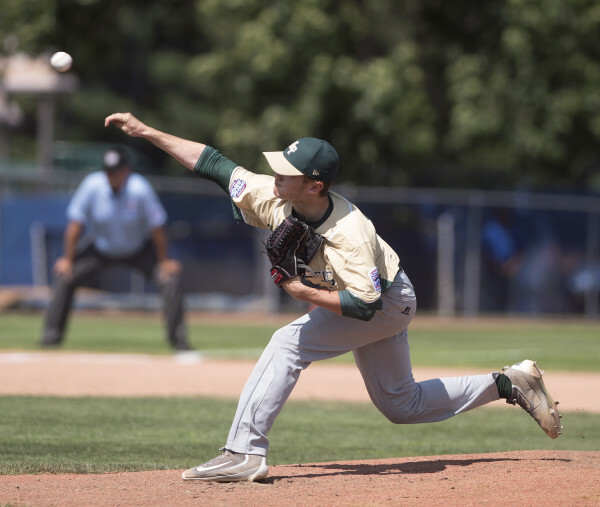 Yet the program’s second chance to win the LIttle League Baseball world championship for 15- and 16-year-olds — Clear Ridge went 0-4 in the 2013 SLWS — nearly ended just as it began. A loss to Burbank American midway through the Illinois District 15 playoffs left the team perilously close to elimination, but Clear Ridge responded with five straight victories — including two wins over Burbank American — to advance to the state tournament where it scored four victories without allowing a run. 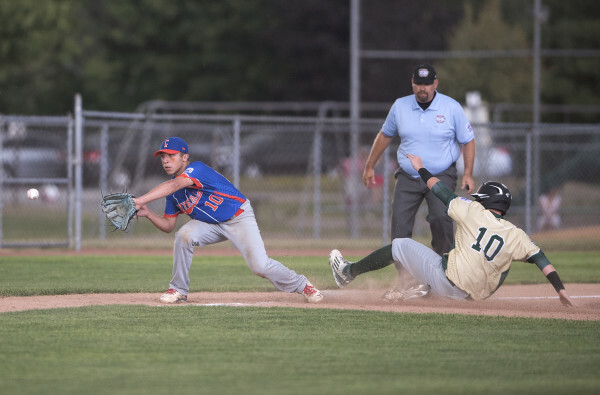 That mindset proved contagious as the streak continued with a five-game run to the U.S. Central title, and Saturday’s victory over the Southern Mariners Little League of Melbourne, Australia, marked Clear Ridge’s 19th consecutive win since the district scare. The lone blip during their SLWS experience came during an earlier meeting against Australia, but the U.S. Central champs rallied from an early 7-2 deficit for a 13-8 win. The other four victories came by a combined 31-3. 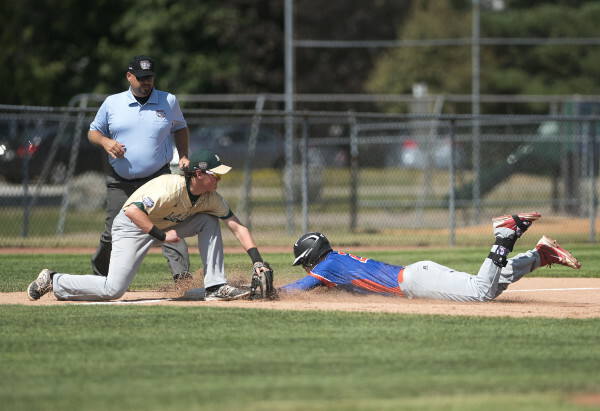 That dominance included the championship game in which Clear Ridge used timely hitting and the pitching of Zach Verta and Paolo Zavala to subdue a hard-hitting Australian squad in its first year of Senior League competition. Verta allowed just two hits and one unearned run over 5⅔ innings before reaching the 95-pitch Senior League limit. He struck out eight — five on called third strikes — while walking two and hitting a batter. “I’ve been shooting low this whole tournament and when I got on the mound today the ump wasn’t really calling it so I had to adjust to the ump’s zone and just shoot wherever she was calling it,” said Verta. Australia, which had rallied from behind to win each of its three previous games, threatened another comeback in the top of the seventh. An RBI single by Jack Dunn cut the gap to 7-2 and the Mariners then loaded the bases with two outs before Zavala got Ciaran Palmer on a game-ending pop out to shortstop Tim Molloy. The only other threat to Clear Ridge’s championship pursuit was Mother Nature, as a thunderstorm engulfed the stadium during the top of the fifth inning, prompting a 95-minute delay. Verta, who threw 78 pitches before the rain came, returned to the mound to face a two-on, nobody-out jam but required just nine pitches to retire the next three batters — two by strikeout — and preserve a 7-1 lead. The U.S. Central champs scored once in the first inning and three runs in the bottom of the second for an early a 4-0 lead. Mike Skoraczewski opened the Clear Ridge first by drawing a walk off Australian righthander Jackson Boyd, then scored when Verta blasted a two-out double down the left-field line. Miller sparked the second-inning uprising with an RBI double and then scored the final run of the inning with a daring steal of home on during a return throw to the mound after Boyd got the second out of the inning via strikeout. Australia closed within 4-1 in the top of the third on an error, a wild pitch and Tim Lane’s sacrifice fly to left. Clear Ridge broke the game open with three more runs in the fourth, an uprising featuring Gage Olszak’s two-run triple deep down the right-field line.